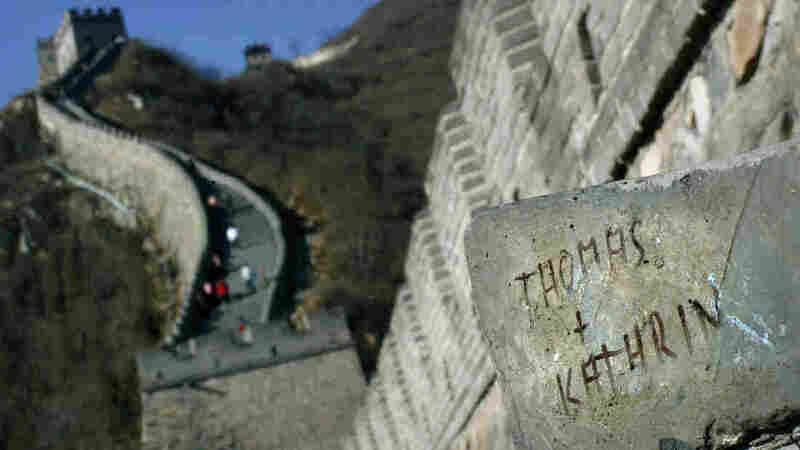 Great Wall of China : The Two-Way Many tourists can't seem to resist leaving their marks on China's famous wall. Authorities are hoping to contain the damage by creating a place where it's OK to do so. Two of the names carved into the Great Wall, in this case near Badaling, China. Authorities hope to cut down on graffiti by giving tourists a designated spot to leave their marks. Chinese authorities are trying to contain a growing problem — graffiti written on and carved into the stones of the Great Wall of China — by giving tourists a designated section on which they can leave their marks. China News Service reports that "Mutianyu, a famous section of the Great Wall of China, has established a specified area for graffiti to better protect the ancient heritage item, the governing authority said on Sunday." Most of the graffiti, the news service says, is in English. The Guardian adds that "the graffiti section will be set up at one of the fighting towers that has become a common place for tourists to scrawl on the walls. Authorities have also aired the idea of setting up an electronic touch-screen graffiti wall in the future." According to the BBC, "Mutianyu, 40 miles north-east of the capital Beijing, is one of the most popular and best-preserved parts of the Great Wall." It's one of many sections of the wall that have undergone extensive renovations in recent decades. Authorities can't make the case, of course, that Chinese citizens never leave behind graffiti when they travel the world. Last May, as we reported, a 15-year-old boy from China used what appeared to be chalk to write a message on Egypt's 3,500-year-old Luxor Temple. As Eyder said, it was a rather mundane marking: "Ding Jinhao was here."